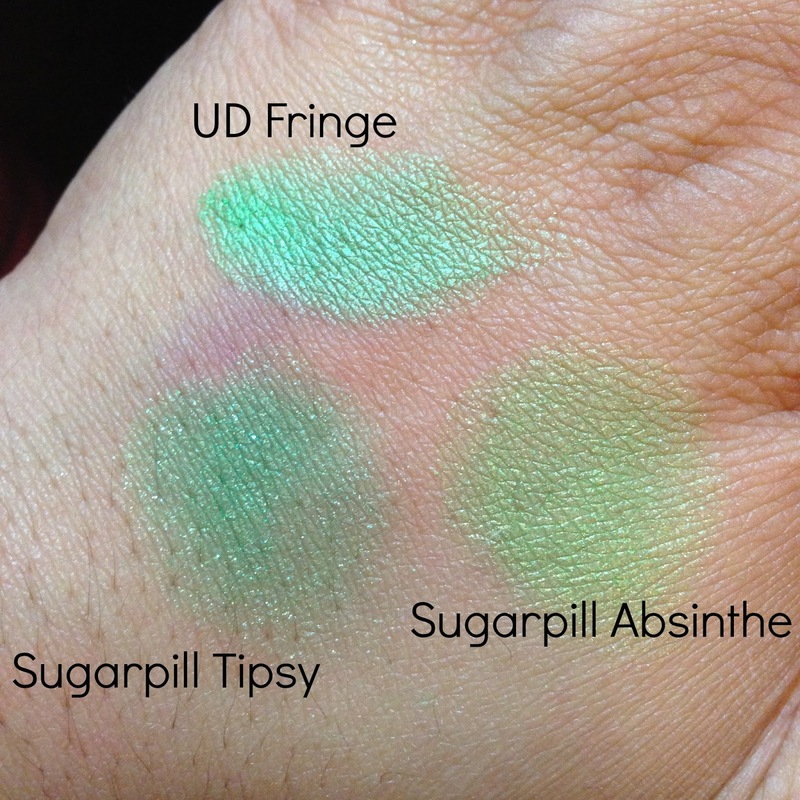 In case you already own a bunch of Sugarpill and are trying to decide about the UD Electric palette (or the reverse), here are some swatches I did. 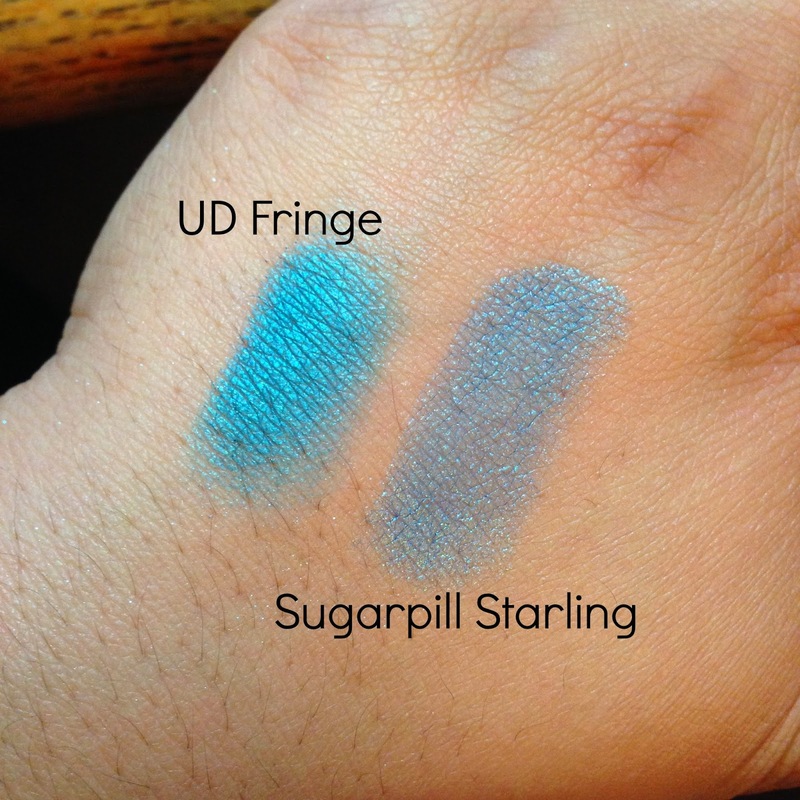 I tried to find the closest Sugarpill shades I could for each UD shade (and I do own the entire line except for one, which I know for a fact doesn't match anything in the palette). 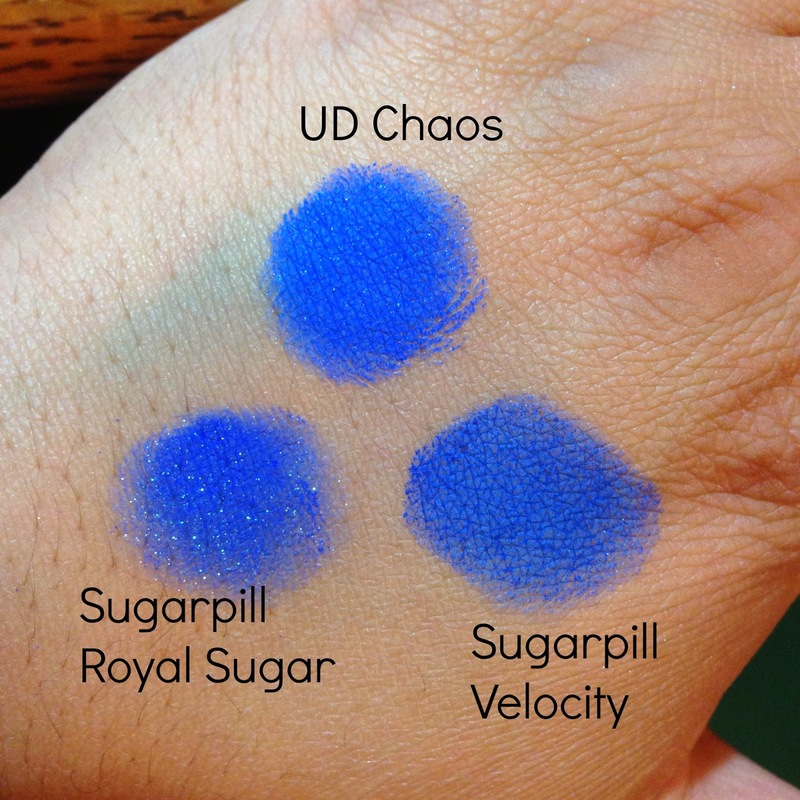 Since Sugarpill obviously has more shades, assume that if I didn't swatch it, then it didn't even come close. 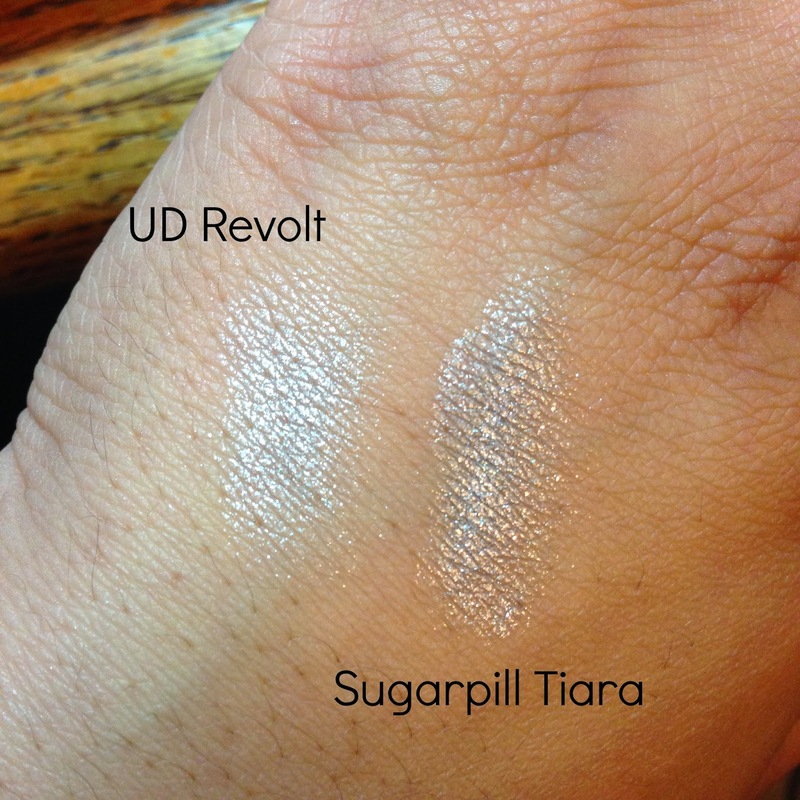 Swatched using my fingers on bare skin. Verdict: PRETTY close. 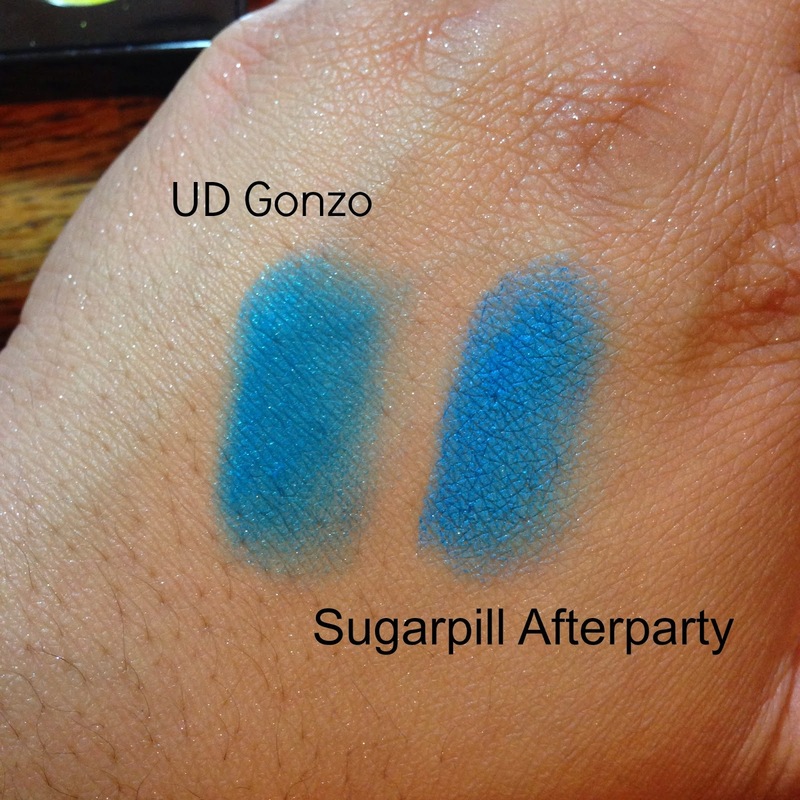 Afterparty is a bit more blue than Gonzo, but just a smidge. Probably not a big enough difference to matter to the average person. Verdict: Nothing similar. 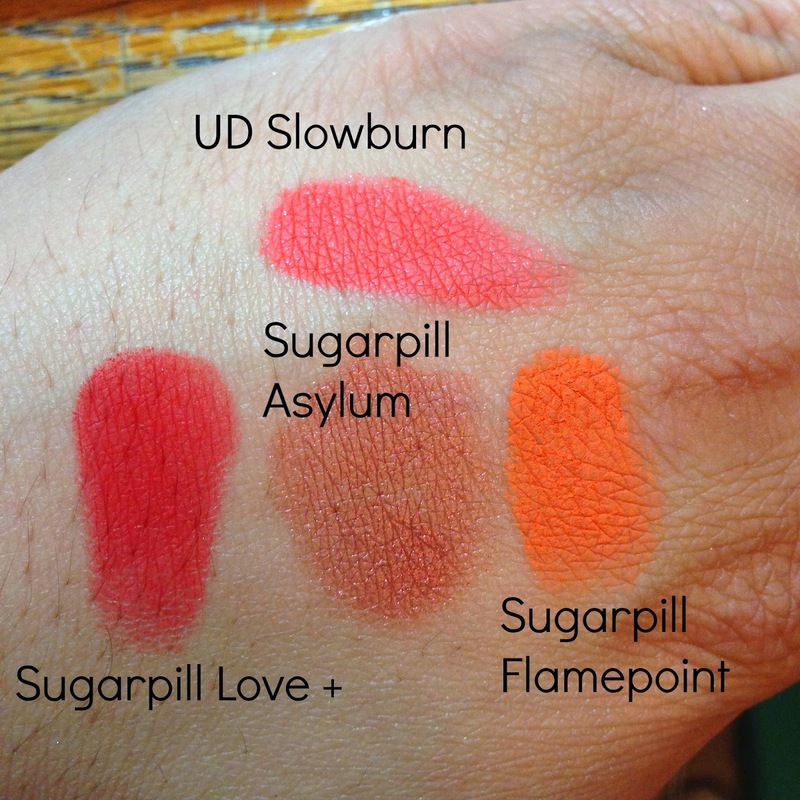 You could probably create a Slowburn-like shade by mixing Love+ and Flamepoint, but you may or may not be into that. Verdict: REALLY REALLY similar. 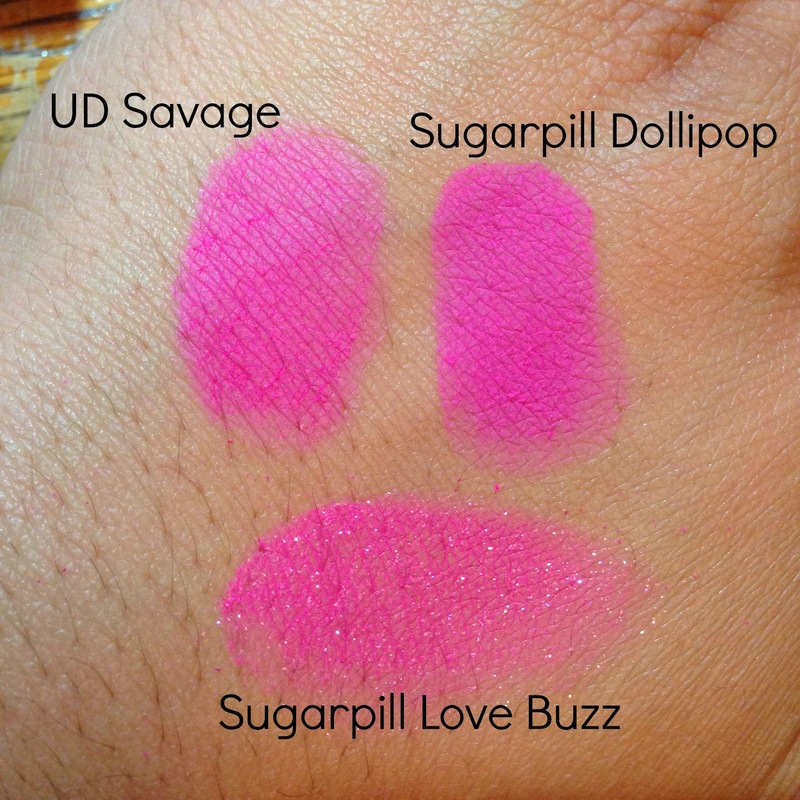 Love Buzz, one of the ElektroCutes, has sparkle to it, but otherwise, it's pretty much the same base shade of pink all around. Verdict: Fringe is lighter/brighter than Starling (which I didn't do a good job of swatching). It's also got more of a sheen to it, whereas Starling is pretty much just sparkly. 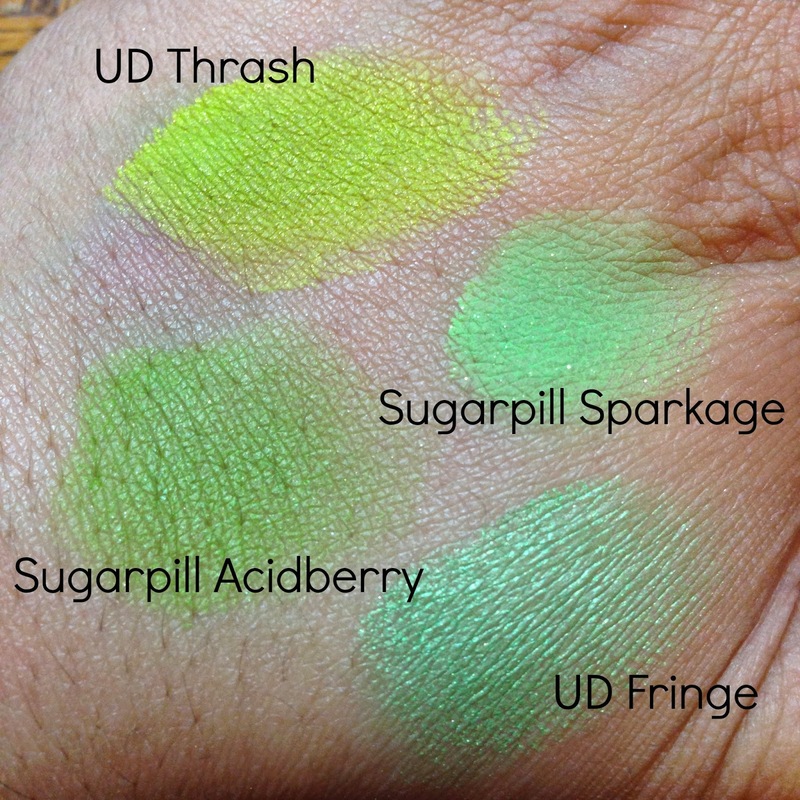 The other Sugarpill teals had more green, so I didn't bother. Verdict: Nothing super close. 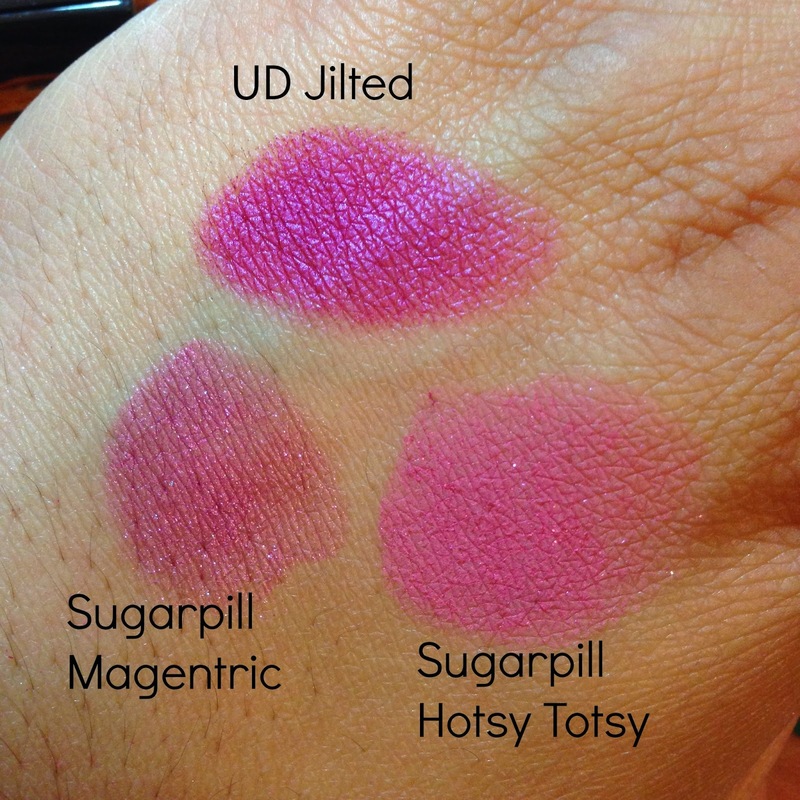 Jilted is more purpley than Magentric, which is the closest thing I could find (but wasn't identical or anything). Verdict: Nothing close here either. 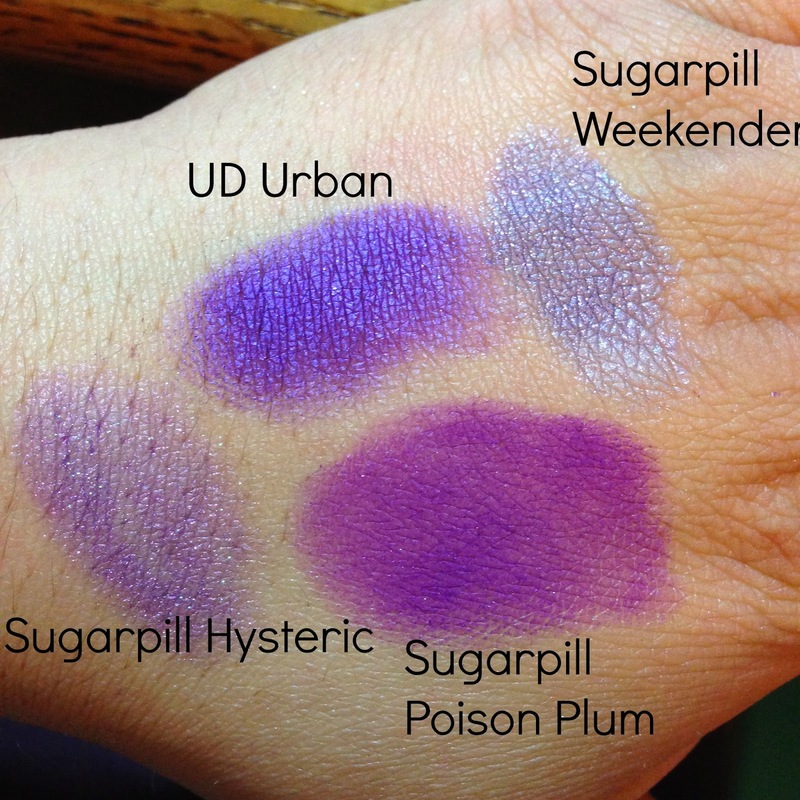 Poison Plum is redder and more matte, and the two loose shadows weren't nearly close. Verdict: Tipsy is pretty close, but it's not as bright. Absinthe is a bit more yellow. Verdict: Nothing remotely close. It's too yellow to match any of the greens, and obviously too green to match either of the two yellows (which I didn't bother swatching). I tacked on Fringe again to see if it matched either of the other two, but not so much. So, only you can decide for yourself if you need multiple bright shades, but hopefully this helped you with your decision-making a little. Also keep in mind that if you're new to brights and are just learning to experiment, then a palette would be a good way to go if you want more shades in smaller amounts, whereas Sugarpill's products are all full-size (even their palettes), but if you only want a couple of shades, then that may be a better choice. Like a girl? LIKE A BOSS.